Yank Sing is open every day of the week and is one of the top rated dim sum houses in San Francisco. It was originally opened in Chinatown by the current owner’s grandparent in 1958. In 2001 it moved to the Embarcadero and then shortly thereafter a sister location was opened in SoMa. We got to the SoMa location 20 minutes before they opened and were first in a line that grew to 30 people deep by the time the restaurant doors swung open at 10am. The wait time allowed us to strategize over which table we wanted; to get the best circulation of carts, avoid the periphery of the restaurant and try and get a table in the middle of the restaurant near the kitchen entrance. This gives you access to the most carts, with the freshest steamer baskets and plates from the kitchen. One critique of Yank Sing’s is that it is a little more expensive than typical dim sum, but one way to hold your costs down is to avoid the non-traditional dishes like honey baked sea bass at $24 a serving or the curried cream cheese shrimp wontons at over 10 bucks an order. The Dumplings: Everything we tried at Yank Sing was great to excellent, with the shrimp Har Gow being the standout. The chunks of shrimp in the Har Gow were absolutely fresh and sweet and were firm and popped as I bit into them. The rice flour wrapper was slightly chewing without being gummy. 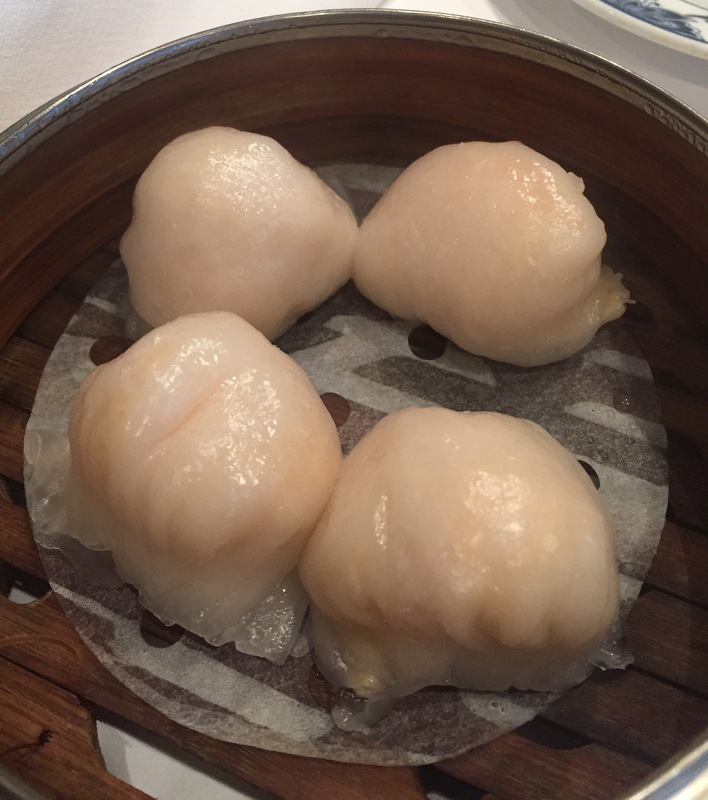 In some dim sum houses the wrappers can be loose or slack and the shrimp fall out of the dumpling as you bite into them. At Yank Sing’s they are practically shrink wrapped around the filling so the dumpling held together perfectly. The BBQ pork buns were also excellent, the bun bread was light and super fluffy with a slight sweet flavor and they were packed with tender pieces of red BBQ Pork. Like an overfilled strawberry jam donut, these buns were pretty messy to eat, each bite squished BBQ sauce out of the side of the bun. 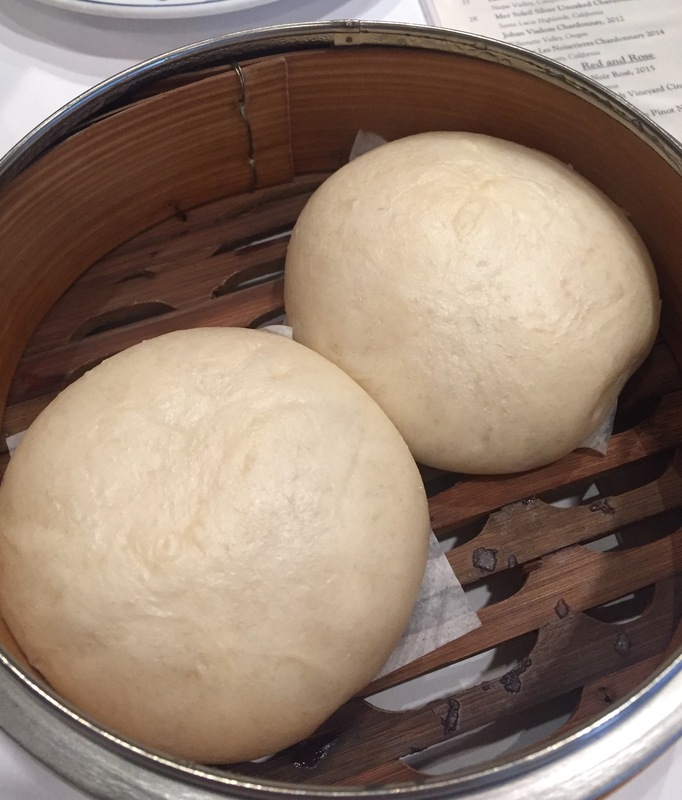 Normally I avoid pork buns at dim sum because I find then too filling, but these were on the smaller side, came only two per order and turned out to be so light they didn’t have a major impact on my appetite. 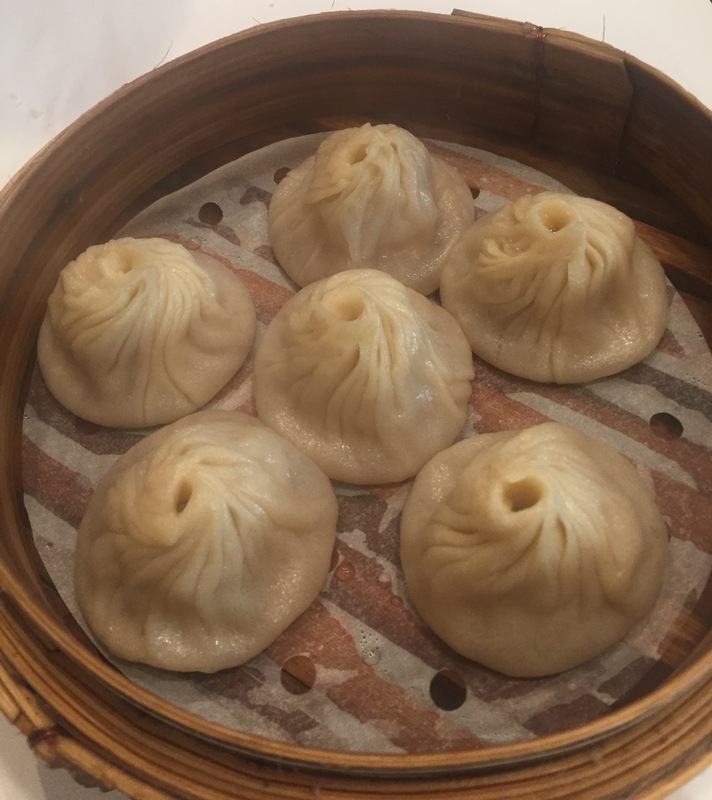 The Xiao Long Bao were the least successful of the dishes. Yang Sing serves then from the carts that roam the restaurant floor and I was afraid that by the time the cart got to us the buns would be cooling and getting rubbery. Perhaps to address this problem the dumplings were over cooked, so they were still blazing hot when we got them, but several of the wrappers had ruptured in the steamer and leaked soup. The dumplings were quite tasty, and while the soup was a little thin in texture, it packed flavor. The pot stickers were the last plate of food we got and by then I was pretty stuffed (we ate non-dumpling dishes too), but I powered through. 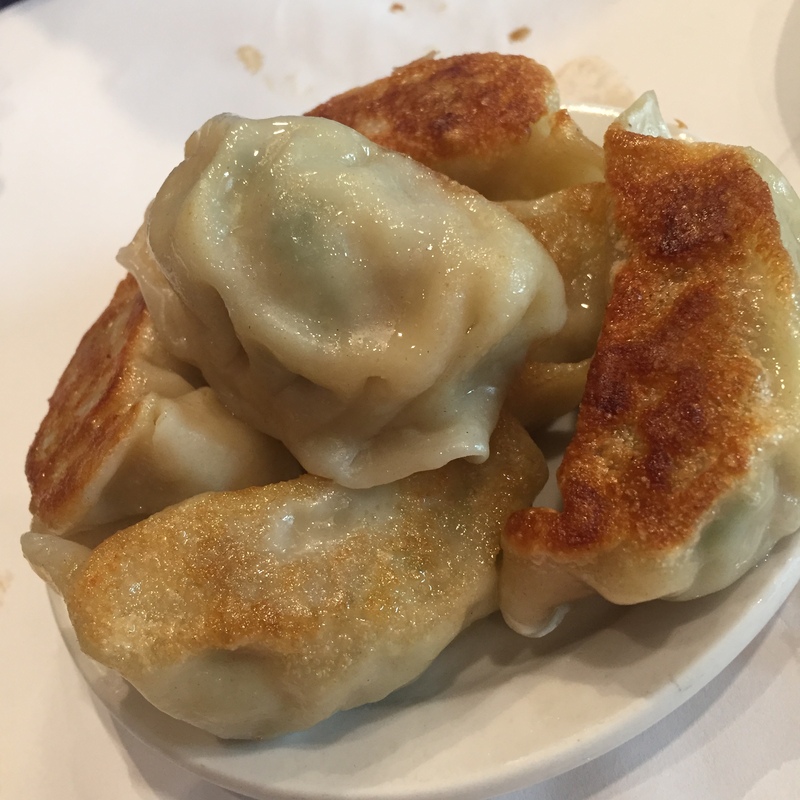 The pork and leak filled dumpling were expertly prepared – the thin wrappers were fried crispy golden on the bottom and steamed through on the top. The pork filling was tightly packed into the wrappers and was savory and juicy. This was another dish that I thought might suffer from sitting on the cart as the servers roamed the room. But the kitchen had food runners periodically bringing plates of fresh pot stickers to the carts so everyone got fresh crispy dumplings. The Dipping Sauce: Each table has a tub of ground red chili in oil, a bottle of soy sauce and a jar of Chinese mustard. You can make yourself some pretty spicy and sinus clearing dipping sauces with these ingredients. The Location: We hit the location in SoMa on Stevenson Street near 1st street. This is an almost deserted, non-disrupt street parallel to Market Street. This entry was posted in Buns, Chinese, Dim Sum, Pan Fried, Potsticker, San Francisco, Shrimp, Soup Dumpling, Steamed, Xiao Long Bao. Bookmark the permalink.